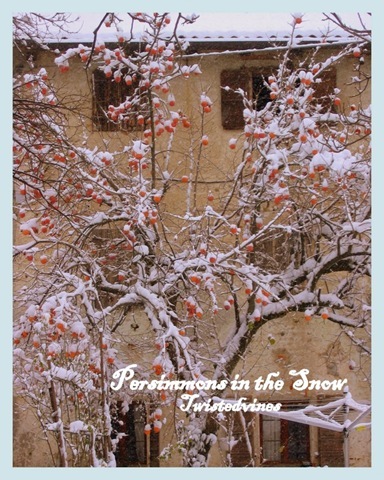 Little orange lit lanterns amongst the snow heavy branches….Winter persimmons cradled in their snow bed. I just love your photo, Yvette! The little bursts of red-orange amongst the wintery snowy and sepia surroundings. Just beautiful!! I do love looking at your Winter pics, Yvette. I’d like them even better if I were somewhere near the Equator whilst viewing them. As it is, they serve as a harbinger of things to come. My Winter this year is far from snow, having a Summer Christmas this year! Thanks Ian, you too. Great memories of an European Winter! Beautiful creation captured by such a thankful heart. Love the antique structure behind the beautiful tree too. This photo pulls me in. Pretty fabulous combination there. The background gives it a depth.